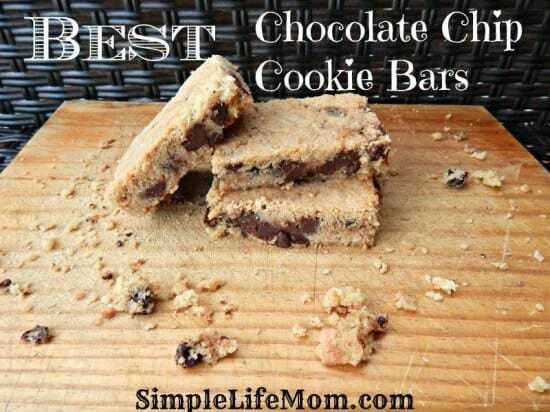 These are seriously the Best Chocolate Chip Cookie Bars that I’ve ever tried. They are soft, buttery, and chocolaty all at the same time…seriously dangerous! Need a great excuse to make them? Make some for a family gathering, church gathering, or even as a Christmas Gift. Tell me you wouldn’t love to get a container of these as a Christmas present!! Put them in a pretty box with a bow and a recipe card and wa la – instant amazing present! I made these for a birthday party and it was a huge hit. I think kids like cookies better than cake anyway. Most of the time you can go to tons of trouble making amazing looking cupcakes and cakes and they will just lick the icing and throw most of it away…at least that’s my experience at birthday parties. Instead, make a giant cookie and be done with it. Everyone’s happy. Enjoy! 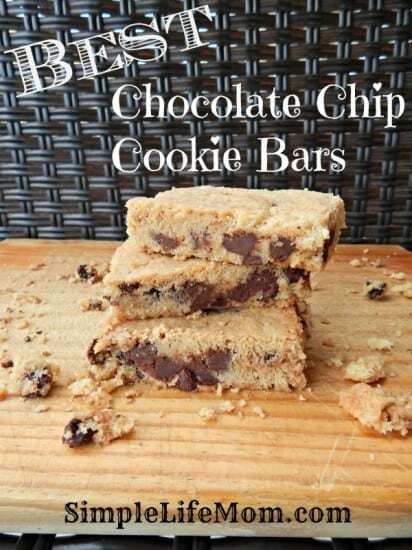 A delicious chocolate chip cookie bar that is soft on the inside, with a crunch to the outside. Combine melted butter, honey, brown sugar, vanilla, and eggs. In a separate bowl, combine flour, baking soda, salt, and chocolate chips. Mix dry ingredients with the wet ingredients. Scrape into a 9in x 13in glass dish. Bake for 25 minutes or until it is lightly brown. Do not over cook or it will dry out too quickly (you want that center to remain moist). Thanks for stopping by. Use the menu tabs above to check out other food recipes as well as other simple living and simple health bath and body recipes. Love your chocolate chip cookie bars. I could easily eat the whole batch! I have seen your amazing recipe at Substainable Couple linky party! Pinned! Sounds yummy and warm in this cold weather! Thanks for sharing with the Thursday Blog Hop! Looks yummy! Thank you for sharing. Cookie bars are great because they aren’t as time consuming as making individual cookies. These sound really good! Thanks for sharing with Hump Day Happenings. Sounds and looks delicious. A great treat for the holidays. Thanks for sharing on Real Food Fridays. Pinned & twitted! These look so good! Thanks for sharing at the Homestead Blog Hop! 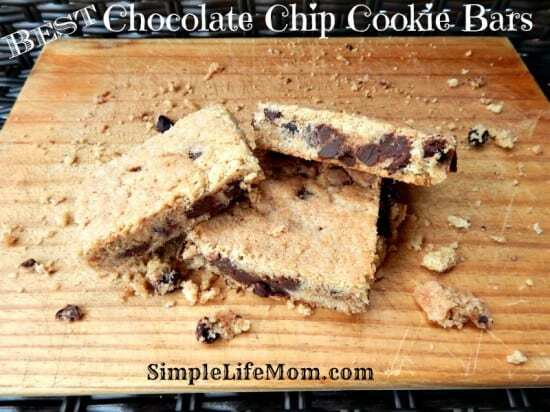 Your Chocolate Chip Cookie Bars look delicious! Hope you are having a great day and thanks so much for sharing this awesome post with Full Plate Thursday. Delicious! Our new family bar cookie favorite!